There’s no need to press a button or turn the bezel on Galaxy Watch to show the time. Set the sAMOLED display to show at all times, letting you see the time whether it’s day or night. Just give it a tap to receive a call or check messages even when your phone is out of your reach. Streaming your music online & connecting with your wireless earbuds makes you free from having your phone with you even you are out for a jog. This watch can measure your heart rate & track six different activities when you exercise. Select to measure up to 39+ types of activities. 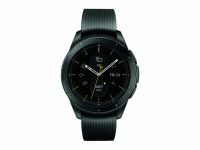 Galaxy watch tracks your sleep quality, creating a log of 4 stages of sleep. It also monitors your stress levels to assist you in reducing stress through guided breathing. Know what each day holds, with this special feature which lets you know what is lined up on the particular day. It also gives summery of your whole day. The My Day watchface displays your schedules for the next 10 hours, summing them up in a single glance. Galaxy Watch comes with GPS so you know where you are and where you’re going. Home IoT function lets you control other objects such as your TV, robot vacuum cleaner, and air conditioner. Use a personalized set of commands to carry out multiple actions at once and that too without disturbing your sleep schedule. To Recieve updates and possible rewards for Samsung 42mm (Rose gold) please sign in. To Recieve updates and possible rewards for Wearable please sign in.